everywhere. Carrying a case of CD now seems completely obsolete, when you can now keep hundreds of CDs in a tiny device that fits in your pocket. But thatʼs music. On November 19th, 2007, Jeff Bezos, the Founder of Amazon (amazom.com) took centre stage to launch what – todate – has become the most popular eBook reader, the Kindle. “We have 90,000 books that you can buy right from the device and have wirelessly delivered. And these are books people want to read… you can duplicate a whole bookstore online…”, Jeff Bezos said as he explained how the Kindle works. That was always going to mark the beginning of a new era. A new chapter in the history of reading. Even though Africa responds relatively slowly to some of such developments, it’s just a question of time. 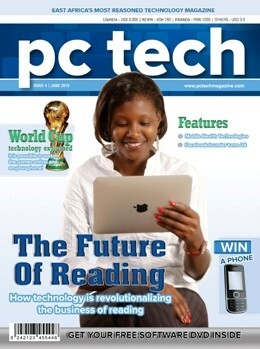 happen that even PC Tech will need to create digital magazines that will soon be delivered to tablets and smartphones. So consider this my apologia. This isn’t a case of excessive introspection on the part of a media insider: The future of publishing is fast becoming topic A in business circles. Financiers who make trades based on access to reliable information fret about the fate of outlets like the Wall Street Journal and the Financial Times. Urban planners worry about what happens to communities if digital books make libraries obsolete. No one can accuse newspapers and magazines of failing to embrace the web. “Shortly after going to Time to write full-time about the Internet in 1995, I abandoned print and did a stint on the web. But I soon realized I couldn’t do online the kind of long-form journalism I wanted to do. The web is for scanning, not deep reading. People typically spend two minutes or less on a site. Why do you think the killer app is called a browser?” Writes Fortune’s Josh Quittner. Worse, it was hard to make a buck. While in those early days we were optimistic about online advertising — the click-through rates were through the roof — it turned out that users were actually clicking on ads by mistake.Call it poor mouse control. The standardization of ad sizes and placements only worsened the problem, relegating pitches to the periphery of content, where they are easily ignored. Revenue growth rates quickly began to tank as it became apparent that no one looks at ads online. (Name one you’ve seen in the past week.) That’s why today online ads bring in junk CPMs (Cost per impressions) — about 10% of the revenue per 1,000 views compared with print. The only new media life form that has managed to live off those junk-ad rates is the blog, a medium that tends to favor breadth over depth and cheap opinion over expensive, original reporting. My Google Adsense account made 22.99 Euros in a period of 2 years over 2 or 3 channels that were focussed mainly on Ugandan views: GCL.CO.UG and ALMUC.COM mainly. Normally, Google issues a cheque when your earnings reach the $100 mark! Which mean’t I still needed to run Ads by Google for 3 more years to earn $100! Question 1: Will anyone be willing to pay for content delivered to a tablet when they can get information for free on the web? unless it figures out new business models. The tablet is a false messiah, he argues. A great device is actually the key here: When you’ve invested in a tablet (or an iPhone or a Droid or a Kindle, etc.) and love it, you want to increase its functionality — with media. That’s why nearly half of the 75 million iPhone and iTouch users download one paid app a month, by the way, when they could get the same kind of stuff for free elsewhere. industry here. The good news is that 12-yearolds, just like their parents still enjoy the medium. But they want it delivered in an exponentially more useful way. the generation that saves the publishing industry. “One innovation of the future will be realtime novelists who craft their stories online as readers interact with the writer and each other, commenting, questioning and pleading for their favorite characters to achieve deserved greatness or avoid gruesome death,” says Jonah Hurwitz of Coral Springs, Fla., winner of the Google Books challenge. If Google Books and other eBook distributors bring the reader closer to the writer and the stories, publishers should be confident that the book industry has been saved by technology and the eBook revolution. Daily Monitor, an independent news publishing company in Uganda seems to be leading the way in digitalisation of news. Just over one year ago, they launched ePaper at http://epaper.monitor.co.ug, which is the closest Uganda has come to e-publishing todate. Whereas there are restrictions to ‘guests’, you can enjoy lots of functionalities when you sign up for your free account. Looking ahead, I can predict that Daily Monitor plans to introduce a small fee for viewing some of that content of course depending on how Uganda, like the rest of the continent, responds to electronic commerce. which is still unsatisfactory, seems to be realizing a solution steadily. My prediction is that as Internet accessibility improves, then we shall see digitalization of most of the administrative processes, and shall start to see less and less of printed material. Including newspapers and magazines. Previous articleDiscussion: Can Uganda contribute to modern Scientific advancement when 50% are illiterate?